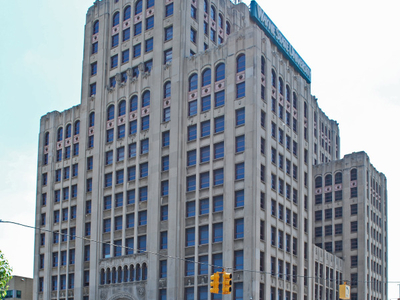 The Maccabees Building (sometimes called Wayne Tower) is a historic building located in Midtown Detroit, at 5057 Woodward Avenue. It was listed on the National Register of Historic Places in 1983. and is currently owned by Wayne State University. The building consists of a five-story base which covers the entire site. The nine-story spine sits above this rising to a height of 197 feet (60 m) with ten-story wings buttressing each corner. The building's exterior resembles the letter "H" with this clearly evident on the fourth through tenth story floorplans. Here's the our members favorite photos of "Historical in Detroit". Upload your photo of Maccabees Building!